The North Carolina General Assembly reached a budget agreement this week. Though the budget was due on July 1, negotiations continued into September. The hold-up was partially based on Governor McCrory's calls for additional funds for incentive programs and the Senate's reluctance to authorize them. A few months ago, I wrote that the Senate's first compromise was a step in the right direction, strengthening some of the tax reforms enacted in 2013 that moved the state from 44th to 16th in our State Business Tax Climate Index. This week, what looks like the final compromise has appeared, and while the budget gives additional funding to incentives (including a reintroduction of the historical preservation credit and an expansion of the JDIG program), the package as a whole represents another round of broad-based tax reductions for North Carolinians. Governor McCrory said today that he will sign the package. $3 million for the OneNC Small Business Fund. $30 million for the Film and Entertainment Grant Fund. $2.5 million a year for Rural Economic Development Grants. Funds the Job Maintenance and Capital Development (JMAC) Fund. Reduces the personal income tax rate from 5.75% to 5.499% in 2017. Increases the 2016 standard deduction by $500, totaling $15,500 for married filers. Extends the historic preservation tax credit, which had sunset at the end of 2014. Restores tax deductions for medical expenses and expands the tax deduction for all people. The policy ended during the 2013 tax reform and was for senior citizens only. Expands the sales tax base. Instead of the Senate’s proposed sales tax redistribution plan, the money from the expanding sales tax base will go to rural counties that do not fare well under the current tax distribution system, for economic development and public education. Allows local governments to charge a municipal vehicle tax, up to $30 per vehicle. Currently, the tax is capped at $5. Continues the corporate income tax rate reduction trigger, which [may drop to 3 percent in 2017, dependent on net general fund tax collections exceeding $20.975 billion in a future year]. Beginning in 2016, phases in single sales factor over three years. Repeals the bank privilege tax in 2016. There is a lot to like in this package. The further reduction in the individual income tax from 5.75 to 5.499 percent makes North Carolina even more regionally competitive. 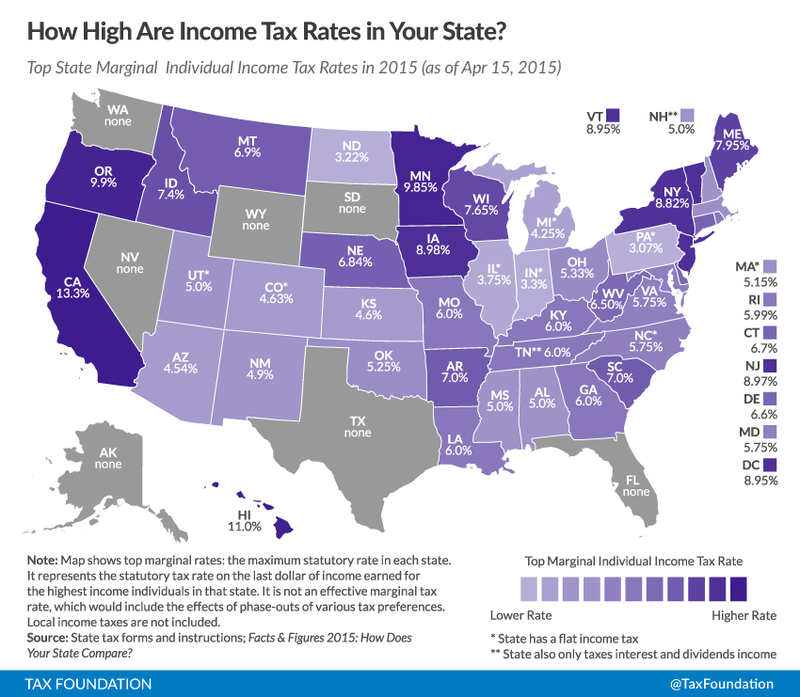 It brings the rate lower than neighboring Virginia, which has a top rate of 5.75 percent, and keeps the state below South Carolina, at 7 percent, and Georgia, at 6 percent (see current rates below). 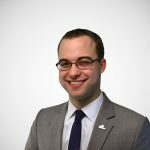 The individual income tax rate matters for small businesses, which are often organized as S-corps and LLCs, which file through the individual income tax, not the corporate income tax. The rate of course also matters for wage-earners and their take-home pay. The increase in the standard deduction gives an additional tax cut for lower income individuals, while retaining North Carolina’s simple single rate system that is the hallmark success of the 2013 tax reform. 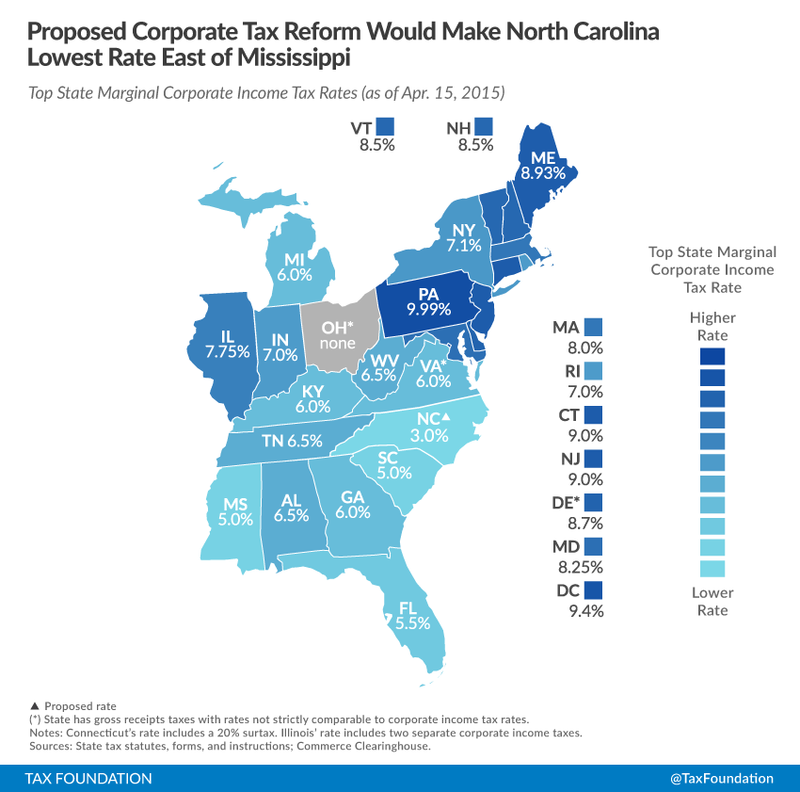 Finally, the reduction of the corporate income tax rate to 3 percent, once fully phased in, will give North Carolina the lowest corporate income tax rate of any state that levies the tax. This has the potential to pay large dividends in the future as the state economy expands financial service centers, research and development operations, and corporate headquarters within the state. Correction: This post originally indicated that the corporate tax rate could fall to 3 percent by 2016, when in fact the effective date would be January 1, 2017 if the revenue trigger is met. This schedule is the same as what was put in place in the 2013 tax reform package, but the trigger requirements have been altered in this year's budget. This editorial in the Carolina Journal details how the corporate tax rate trigger was slightly weakened. The error is corrected above.